Most international flights stop at Johannesburg (in some cases, before heading onto Cape Town) but few choose to actually spend time in South Africa's second biggest city. Don't make the same mistake—Johannesburg has plenty going for it including a dynamic art and dining scene, on top of the city's renowned monuments and museums. History buffs should not miss a visit to Mandela's home, but if you're keen to immerse yourself in Johannesburg's creative soul, try your hand at neighbourhood hopping. From Melville to Maboneng, the city has plenty of quarters where you can enjoy a stroll and discover a trove of colourful street art, amazing local boutiques, as well as happening cafes and restaurants. Nestled in a central yet serene part of Johannesburg, Four Seasons Hotel The Westcliff offers guests a new perspective on the city (literally). Its elevated perch on Witwatersrand makes it a respite from Johannesburg's chaotic energy, and it has been a well-loved escape for residents and travellers for over 20 years. It's the ideal place to take it easy—whether that means indulging in a spa treatment or staying in your room and burying yourself in a book (we do recommend occasional pauses to take in the view). We loved walking around the elegant hotel grounds during the day, but our favourite activity was luxuriating at the very aptly named View restaurant and bar called Pre View, which is the choice spot to enjoy a glass of South African wine while taking in the glorious panorama. A visit to the Mother City requires at least a week, but for those short on time, prioritise seeing the city's dynamic art and design scene. Cape Town has long been South Africa's creative capital, and the arrival of the Museum of Contemporary Art Africa (Zeitz MOCAA) in 2017 solidifies that reputation and extends it to the whole of the continent. This Heatherwick Studio-designed museum is the first building of its kind in Africa to be devoted solely to contemporary art, and aims to “collect, preserve, research and exhibit art from Africa and its diaspora”. Housed in a converted grain silo and spanning seven floors, the "Tate Modern of Africa" houses the collection of German businessman Jochen Zeitz and will showcase a slew of exhibitions year round. Perched on a cliff in the exclusive enclave of Bantry Bay, Ellerman House already stands above the other hotels in Cape Town. A true classic, this gem of a hotel is well-loved for its homely, old-world character, exquisite food, and wine, but most of all for its unparalleled collection of art. Forget finding run-off-the-mill art pieces in your room or at the lobby. Instead, take in the 1000-strong collection of valuable artworks carefully incorporated into the hotel’s tasteful interiors and grounds. The collection spans mid-nineteenth century to present—from the avant-garde outdoor sculptures to priceless works adorning the hallways to the dedicated gallery, the art immersion alone is well worth the price of entry. A short drive away from the city is a haven for all oenophiles. With vineyards spanning nearly 100,000 acres, the Western Cape produces some of the world’s most unique bottles—including pinotage, a varietal unique to South Africa—at incredible value. Follow one of five recommended wine routes or settle into a particular valley to explore things in depth. andBeyond recommends the charming Franschhoek, noted for its centuries-old vines and Cape Dutch architecture. With 52 wine farms and 48 restaurants serving a population of 25,000 in the greater valley, you're unlikely to get tired of (or get hungry) in this gourmand’s paradise. While there are plenty of winery-hotels dotting the Western Cape, Leeu Estates' choice location amidst the mystical mountains alone is enough of a draw. Set on a sprawling property with vineyards, gardens, and fynbos, the stunning luxury hotel and winery makes guests feel far away, though in fact, it's only a short walk from Franschhoek village. Of course, direct access to Mullineux & Leeu Family Wines—a joint venture between Leeu Collection owner Analjit Singh and winemaking duo Chris and Andrea Mullineux—is a big plus. Wines by the award-winning label have achieved top ratings from the respected Platter’s South African Wine Guide and named it Winery of the Year twice, while Andrea was named Winemaker of the Year in 2016 by US-based magazine Wine Enthusiast. After an exhilarating flight with Airlink, one arrives at the unspoilt Phinda Private Game Reserve—a great place both for budding and seasoned safari goers. Few experiences match the high of being in the bush, and though you'd imagine being tired of going on two drives a day, you'll never get enough as each experience is completely different (andBeyond offers plenty of surprises, too, which we won't spoil here). Being a private reserve and with the expert guidance of the best rangers and trackers in the continent, guests are able to enjoy a quiet moment observing a rhino or following a lion hunt its prey. In our case, we were lucky enough to see the Big Five in just two days. 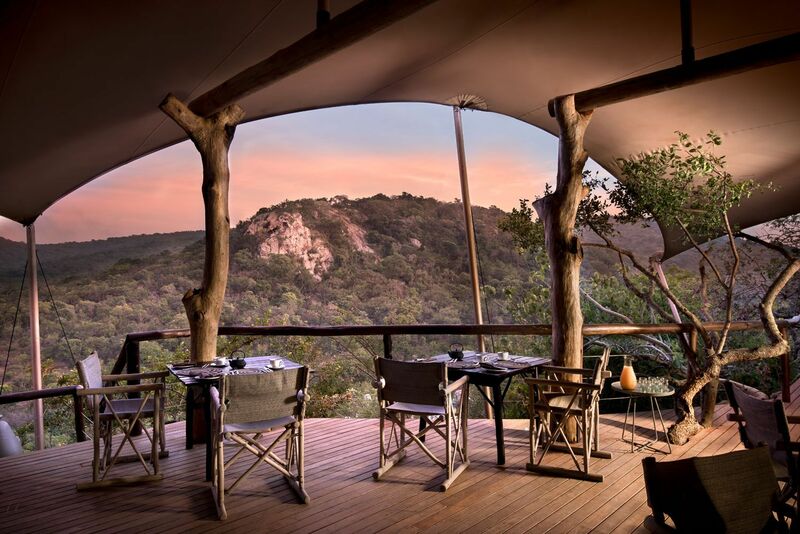 One of the three lodges operated by andBeyond in Phinda Private Game Reserve, Phinda Rock Lodge has been welcoming guests for over two decades but still feels like a secret waiting to be uncovered. Blink and you will miss its stone grey facade, which emerges like a natural rock formation atop a cliff. The recently renovated viewing deck offers a great vantage point to take in the panorama of the bush, including a clear view of Leopard Rock that is home to a troop of baboons. The hotel’s intimate size (it has only six suites) and open design (it isn’t fenced in) allow for an up-close and personal encounter with the animals, as well as the fellow guests. Find our complete review here.